Following the ARAC provincial’s training sessions; awareness raising training sessions on Afghanistan constitution conducted for the professional officials of Afghanistan independent human rights commissions, department of women affairs, department of Haj and religious, department of education, and civil society activists of Nangarhar, Laghman, Kunar, Nooristan provinces from 16-19 September 2018 in Nangarhar zone. In this program, beside the important subjects of ARAC’s literature guide on Afghanistan Constitution prepared by (HBORL and OSA) the participant discussed and shared their knowledge in different group works on important topics including (Definition of civil society and its role during the implementation of the constitutional law in Afghanistan, Do all Afghan have the equal rights in law and what is the discrimination points? what are the election systems and which systems do we implement in Afghanistan?, Flaws and benefits of the presidential and parliamentarian systems, the difference between State and Government, the difference between nationality and citizenship, and what are similar and contradictory points between Islam and Democracy). In the meantime; a group of young people played a role regarding violation of the Afghanistan constitution article 22 “any kind of discrimination and distinction between citizens of Afghanistan shall be forbidden. The citizens of Afghanistan, man, and woman have equal rights and duties before the law” Afghanistan Constitution Article 22. 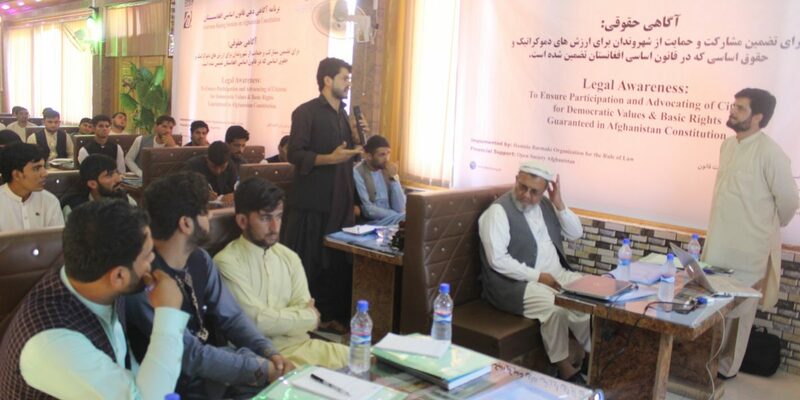 In the second part of the program, the students of Sharia, law and political science faculty of Nangarhar and Alfallah private universities have participated in public lecture sessions on Afghanistan constitution, and the participants encouraged to take part in Article Writing Competition program as well. Whereas, September 31, 2018, is the deadline for article writing in Nangarhar zone. 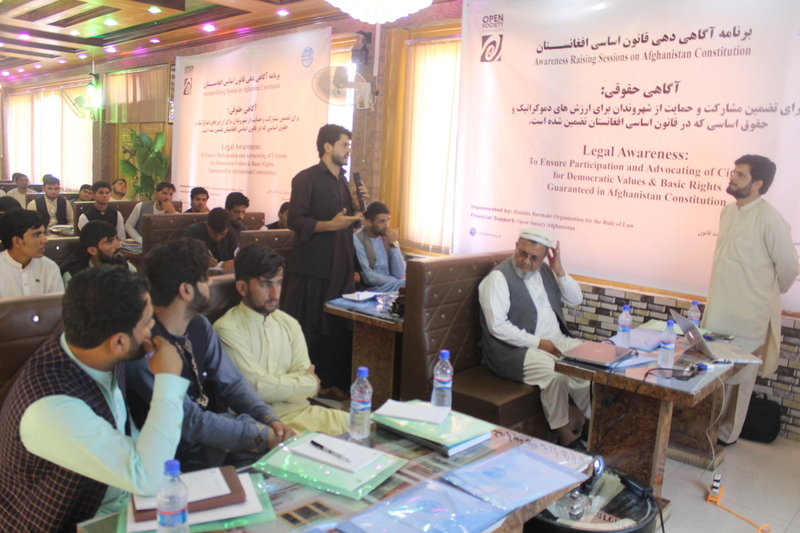 Mr. Zabeeullah Zaki, one of the program participants on behalf of others thanked HBORL and OSA for conducting such a useful program and considered the awareness on Afghanistan constitution sessions valuable, essential and important. Meanwhile, he shared his concern regarding the security situation in Nangarhar province and requested the continuation of such a program for a long period.